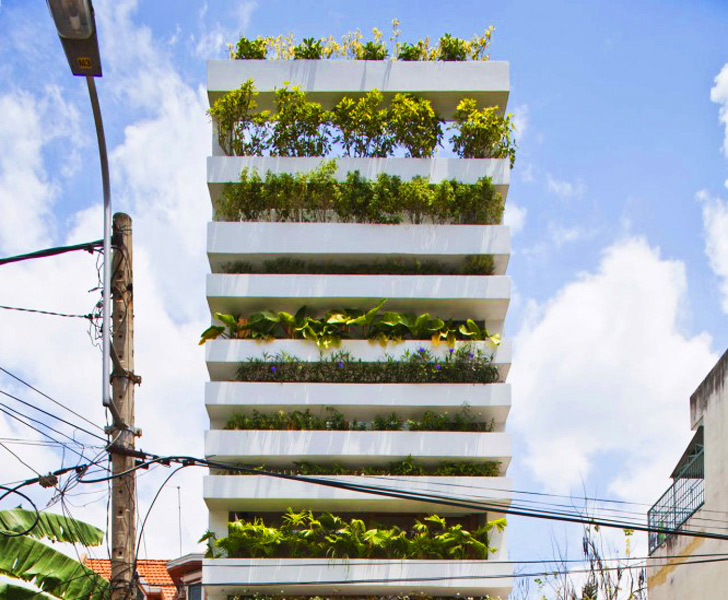 A busy and crammed Saigon neighborhood was recently given the gift of green respite in the form of a home with <a href="https://inhabitat.com/flower-tower-380-potted-plants-line-parisian-apartment-facade/">a facade made of stacked planters</a>. 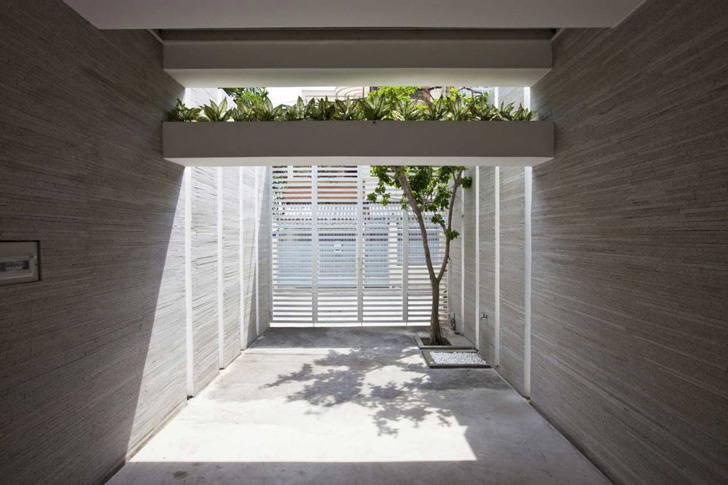 Named “Stacking Green”, the small ‘tube house’ hidden behind a garden was designed by <a href="http://www.votrongnghia.com">Vo Trong Nghia</a> for a couple and a parent. 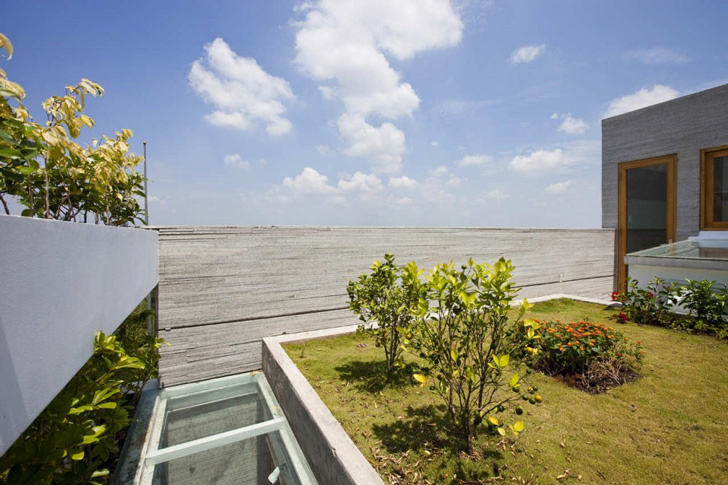 The home is bookended with plants, features a <a href="https://inhabitat.com/green-roof/">green roof</a>, and has a large opening in the core to allow air through - these measures make the space a low-energy escape from the urban busyness just a few meters away. 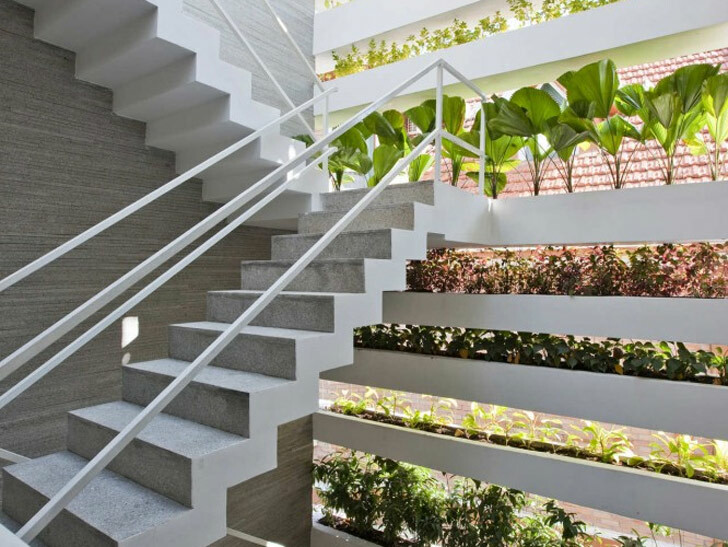 Measuring only <a href="https://inhabitat.com/amazing-showa-cho-micro-house-is-only-ten-feet-wide-inside/">4 meters wide</a> by 20 meters deep, the Vertical Green home has a layered program that is kept as open as possible to make the space feel less cramped. The concrete planters, stacked 25 to 40 cm above each other (depending on the plant species) are predominant from anywhere in the home. The planters are fed water by a built-in drip irrigation system, making maintenance a breeze. 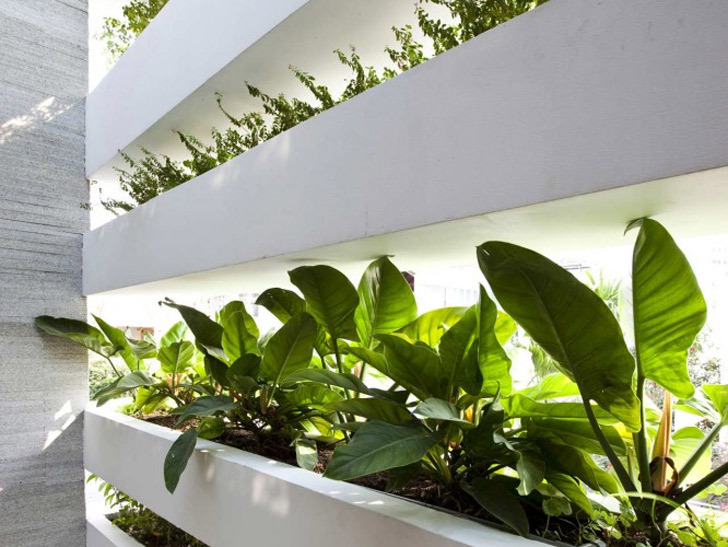 Speaking of breezes, the planters also act as a filter from the street, helping to reduce dust from incoming air. 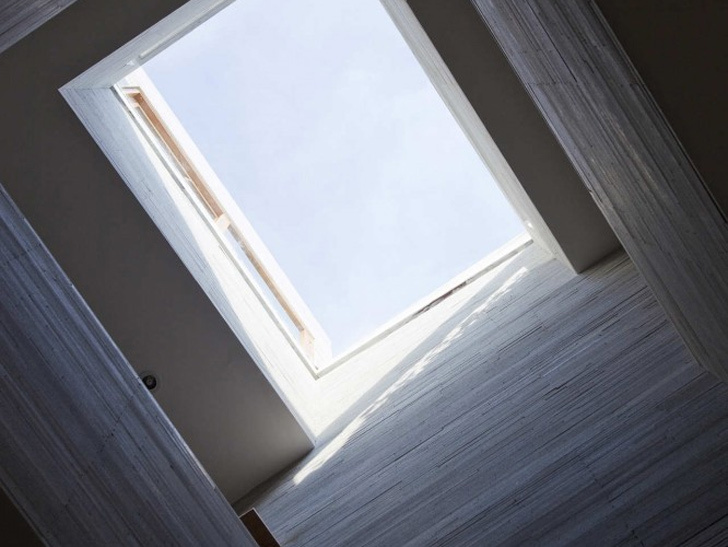 A large skylight in the core of the home opens to exhaust the stale indoor air and promote welcome<a href="http://www.motherearthnews.com/green-homes/natural-cooling-zm0z11zphe.aspx"> cross breezes</a> in the muggy climate. 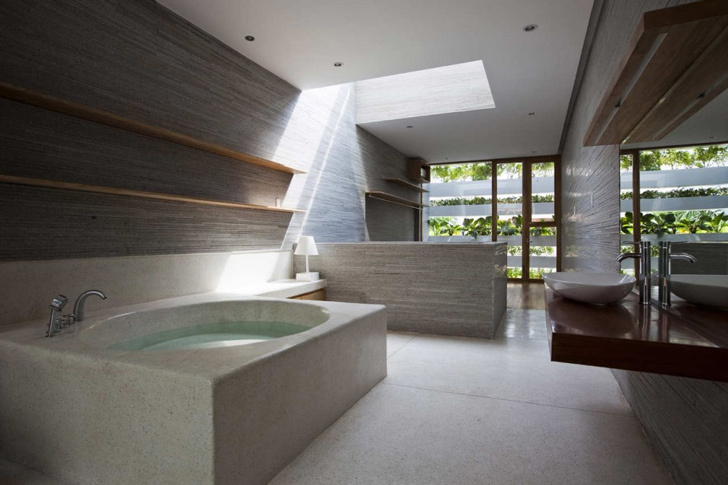 A large opening on the lower floor mirroring the size of the skylight adds low-impact illumination in the public area. 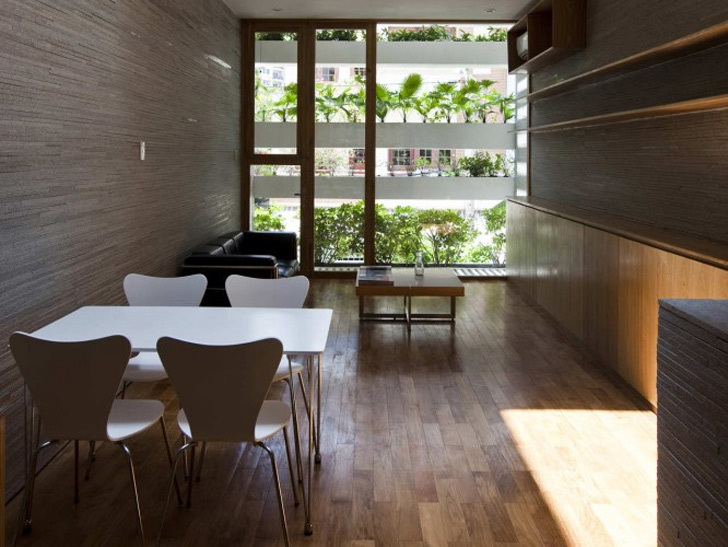 Stacked four floors high, the home is both intimate and private for a difficult lot. The uppermost half-sized floor opens to a tiny <a href="https://inhabitat.com/green-roofed-house-is-a-four-season-home-in-beautiful-ontario/">green roof</a>, providing views and a place to unwind well above the chaotic streets. 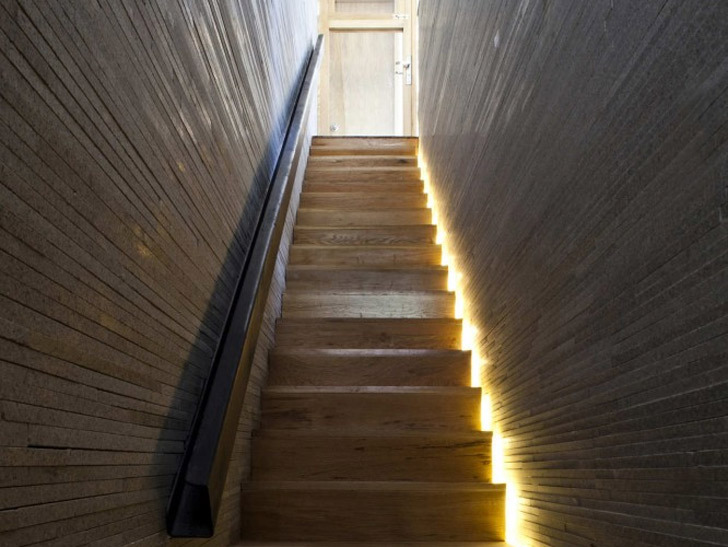 The rich but modern textures throughout the home feel like <a href="http://en.wikipedia.org/wiki/Stratum">layers of strata</a> on the carved side of a mountain, and they add a unique almost organic quality to the interior. With diffused green light streaming through the planters in the morning and evening, the inhabitants are treated to their own private city oasis. 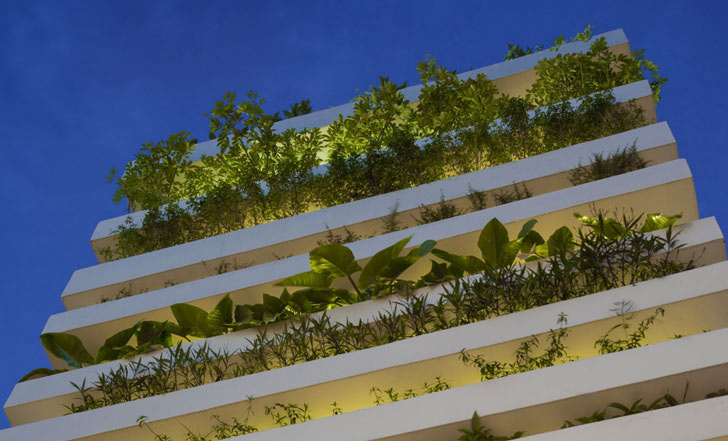 A busy and crammed Saigon neighborhood was recently given the gift of green respite in the form of a home with a facade made of stacked planters. 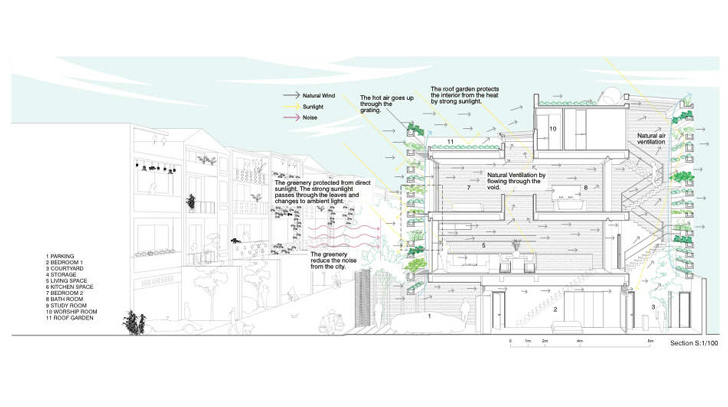 Named “Stacking Green”, the small ‘tube house’ hidden behind a garden was designed by Vo Trong Nghia for a couple and a parent. 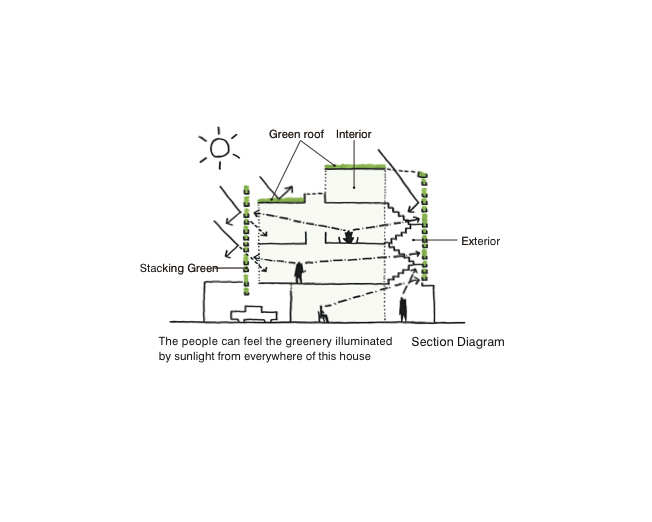 The home is bookended with plants, features a green roof, and has a large opening in the core to allow air through - these measures make the space a low-energy escape from the urban busyness just a few meters away.